Pointe aux Piments is located on the northwest coast of Mauritius and boasts one of the best beaches on the island. The area is rapidly growing to be one of the most popular tourist resorts in Mauritius. Locally there is a lot to see and do, including golf, deep-sea fishing, scuba diving, boat trips and submarine rides. Mauritius has a tropical climate, with moderately high temperatures and humidity all year around. Although they can reach the mid-30s, temperatures never rise to such high levels that they become unbearable. The wettest period is from January to March and during these months cyclones may pass nearby giving occasional heavy rain/wind, making May to November is much drier. •	The Balaclava Ruins and its open-air museum. It is free to visit, but you must have permission from the Maritim Resort. •	The Botanical Garden Centre is found in the Pamplemousse district, famous for its water lily gardens. •	Aapravasi Ghat was also known as the Immigration Depot in Port Louis. This historical site is where ½ a million immigrants transited to work in the sugar plantations. •	For shopping, head to Caudan Waterfront in Port Louis for a unique shopping and dining experience. •	Hike Le Pouce or Thumb Mountain for a spectacular view of Port Louis. The beaches in Pointe aux Piments, despite their location, are generally (luckily!) quiet. They don’t have a lot of tourist amenities, so head to Troux aux Biches is that’s what you’re looking for. 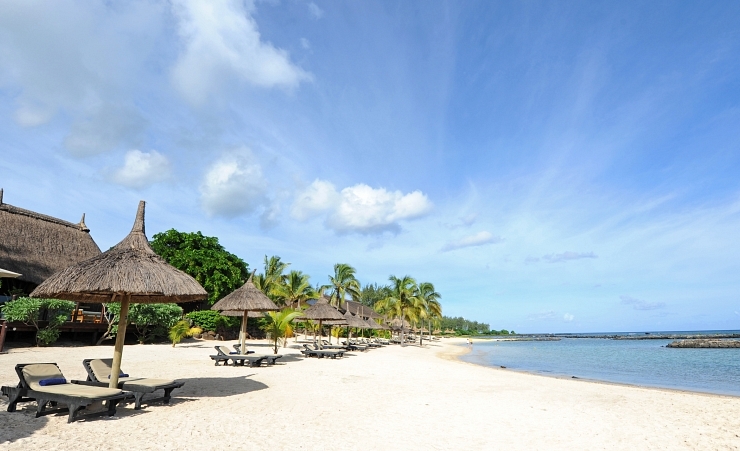 Mont Choisy Beach brings in many tourists to one of the most extended stretches of sand in Mauritius. Much like the rest of the resort, it is the perfect place for those seeking a quiet and relaxing holiday. Spend the day sunbathing on the beach or swimming in the clear emerald waters, with street vendors close by you won’t need to leave. For a cultural and religious experience in Mauritius, visit Triolet and see Maheswarnath temple, Notre Dame de Fatima and Sarvodaya Ashram. This area of Trou aux Biches is home to a majority of the places of worship for visitors to see. Many restaurants and cafes in Mauritius are found near the beaches and offer a perfect view of the sunset while serving a multitude of cuisines. Voile Bleue provides local and international meals with a view of the lagoon. Nightlife in Mauritius is mostly kept to the hotels unless you head to the north coast and Grand Baie. As with the rest of Mauritius, there are many dive schools and excursions to take advantage of while in Pointe aux Piments. Check out the tropical fish and coral reefs underwater or from a glass bottom boat. Kitesurfing is also popular around Mauritius and watersports can be found on the bigger beaches. Head up the coast to Mont Choisy for one of the best 18-hole golf courses in Mauritius. Buses around Mauritius are readily available but can be quite time-consuming. For ease of travel try the taxis that can be arranged from the hotel receptions. It is best to negotiate the price of your trip before setting off to avoid extortionate prices. Why holiday in Pointe aux Piments?